Jonathan MS Pearce. 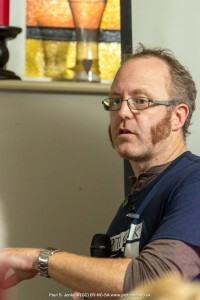 Seen here at a Skeptics in the Pub event explaining why Jesus could not have liked Doctor Who. Photo by Paul S. Jenkins. The phrase exceptionally meritorious service is part of the description of the US Air Force commendation medal recipient. Nobody deserves commendation more than Jonathan MS Pearce. For JP, being a consistently excellent writer with erudite, incisive posts barely begins to describe his many contributions to the success of Skeptic Ink. I will list of few of those here. My memory likely does inadequate justice to the full list. …has tirelessly promoted and supported SIN, publicly and in our private community. Almost from the beginning. …served on the SIN Advisory council. 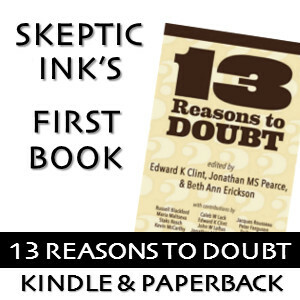 …published and helped edit our terrific book, 13 Reasons to Doubt. Most of you will not know this, but this was a ton of hard work and for many months. More than any one person, JP made it possible, and made it great. …created the Skeptic Ink Network Weekly. …consistently produced other new ideas to try. His enthusiasm and creativity has been a huge boon. Objective accomplishments aside, JP has been my right-hand man here for ages. He has listened to me vent my frustrations, helped me through difficult moments with the network, and always gone out of his way to help. I am guessing that I am not the only one who might say as much. He has been a true and loyal friend through everything. I expect that I will not meet a more genuine human being in my life. It’s worth noting that the likes of Center for Inquiry, Freethought Blogs (in its more successful days), and Patheos have all tried to poach Skeptic Ink writers. I am proud that Skeptic Ink has such regard, and that it is a harbor and promoter of so many dynamic, interesting writers. Imperfect as the circumstances may be, I am very pleased if Skeptic Ink has played a part in producing opportunities for JP. I understand and fully support his choice. Thanks for everything, JP. I shall look forward to sharing a pint with you whenever I am next about England. I’m someone who has started to study psychology(i’m still in highschool) and I’m starting to get in evolutionary psychology but I saw a post by Richard carrier title : Is 90% of EvoPsych false ? And I wanted to know if he’s right or not. This post is not an appropriate place for such discussion, but I will reply briefly. Richard Carrier’s headline is hyperbolic and untenable. He has a doctorate in history, but is not a social scientist of any kind and has no expertise on this subject matter specifically, nor scientific research in general. He is welcome to his lay opinions, but they should not be taken as more than that. Did he? His “qualified experts” section is dominated by three “experts” who have no background in the study of human behavior whatsoever: Jerry Coyne (biologist), Richard Lewontin (geneticist), and PZ Myers (biologist). Carrier’s treatment of this subject is inept and appears politically-motivated. It repeats tired old canards about misogyny and racism so absurd that they elicit laughter from actual evolutionary psychologists.